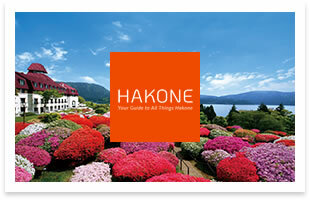 Hakone Navi delivers useful information about fun things to do and transportation in Hakone. 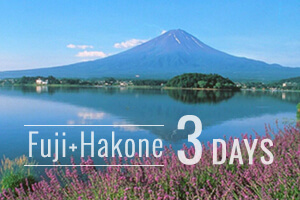 Traveling on the Odakyu Limited Express Romancecar, Hakone is about 75 minutes from Shinjuku at the foot of Mount Fuji. 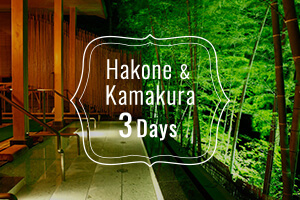 For more than 400 years, Hakone has flourished as a favorite onsen destination. 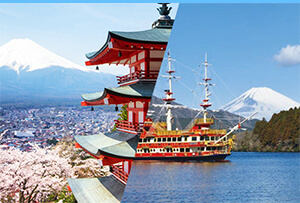 In Hakone, there are many fine hot springs (onsen) and locations with magnificent views of Mount Fuji. 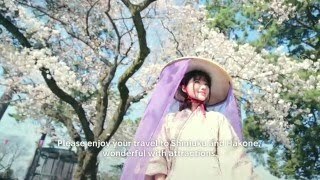 Treat yourself and enjoy the beautiful scenery in so many different ways: onboard a Hakone Sightseeing Cruise, from the shores of Lake Ashi, from a high-in-the-sky gondola of the Hakone Ropeway, or while bathing in a hot spring.And if that isn't enough, be sure to visit such historic attractions as Hakone Checkpoint or the stone-paved avenues of Kyukaido (old road), and for art lovers, there are unique art museums including the Hakone Open Air Museum. For nature lovers, it's easy just to stroll through the beautiful scenery and watch the seasons as they change. 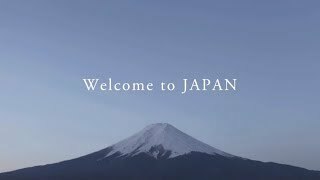 A volcanic crater lake famous for its beautiful view of Mount Fuji. 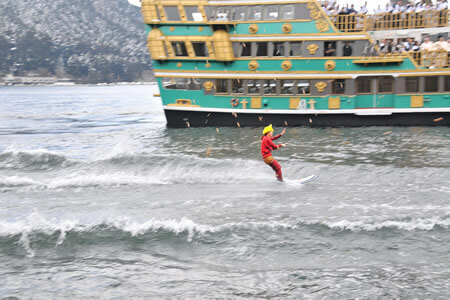 The elegant sightseeing cruise and lake sports such as kayaking are very popular here. 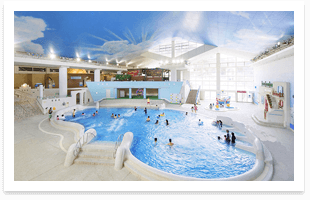 Open-air baths called rotemburo are very popular for taking in the cheerful sunlight in the day and gazing at the starry sky at night. 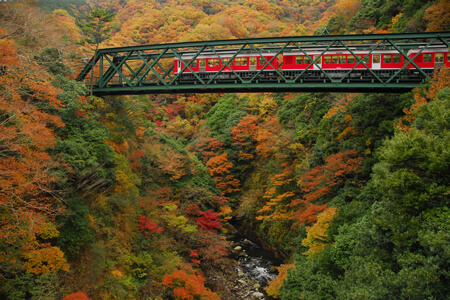 The superb views from special points, especially from the Deyama Bridge, looking down 43m to the riverbed are breathtaking, and the scenery visible from the train windows is simply magnificent. 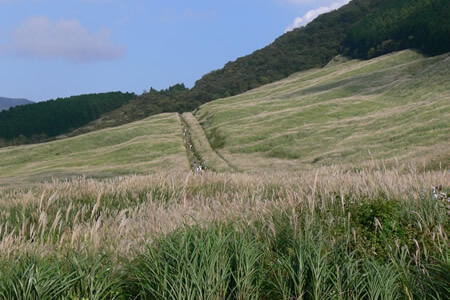 Among the verdant natural beauty of Hakone is Owakudani, a desolate volcanic valley. 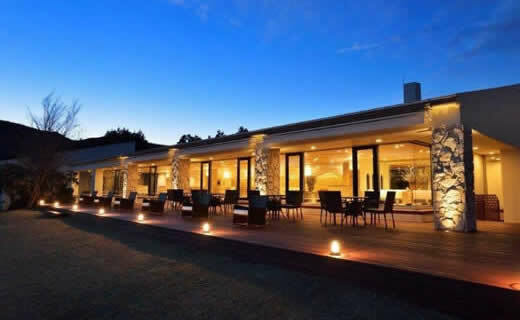 Salon de Thé Rosage is a patisserie of the Hotel de Yama. Wonderful scenery. A beautiful lake. What could be finer than a luxury tea on the shores of Lake Ashi. 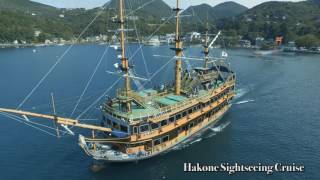 Enjoy magnificent scenery from the Hakone Ropeway. 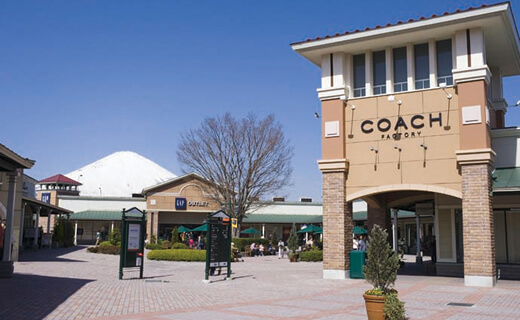 With a great view of Mount Fuji, Gotemba Premium Outlets® pioneered the outlet shopping trend in Japan. 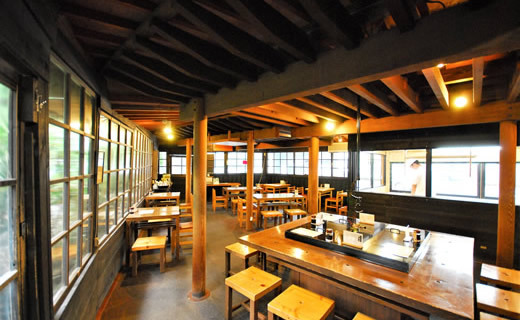 An ancient road from the Edo period which runs for 2 kilometers with trees on both sides. 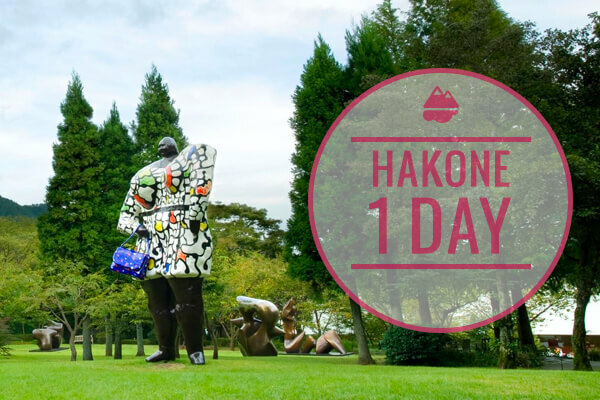 If you want to enjoy the beautiful colors of fall, Hakone is a strong recommendation! 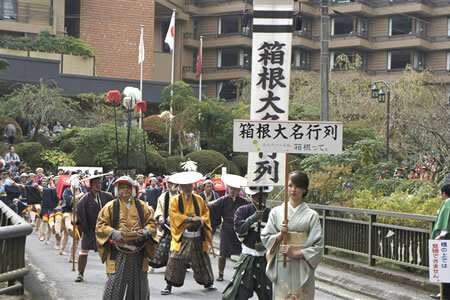 When the autumn leaves turn ever deeper colors, the Hakone daimyo procession is held at Hakone-Yumoto. This custom began in 1935. A multitude of seasonal flowers can be seen in the fields of golden-colored silver grass. 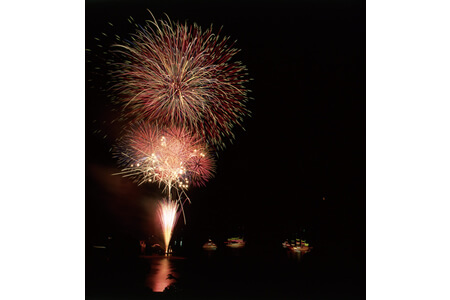 Create summer memories with the fireworks at Lake Ashi! 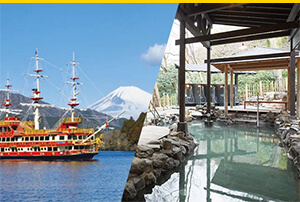 Summer in Hakone is filled with exciting events, including traditional rituals expressing local history and colorful fireworks that color the night sky. 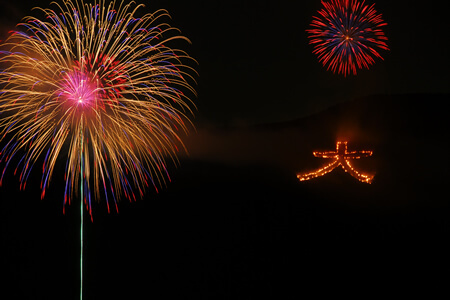 On the evening of August 16, a fire in the shape of the kanji character 大 (dai) is lit on the slopes of Mount Meijogatake when dusk falls. 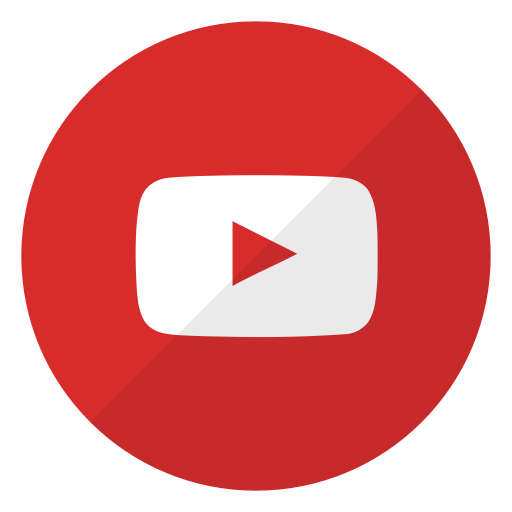 The horizontal stroke is 108 meters long, the stroke from the top sloping down to the left is 162 meters, and the stroke from the center sloping down to the right is 81 meters. 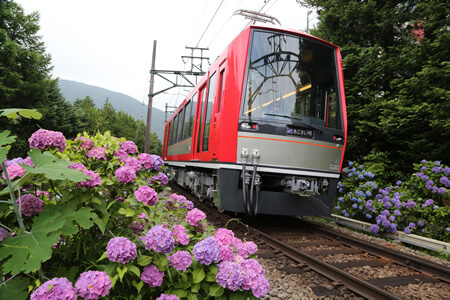 Admire hydrangeas from the Hakone Tozan Train as it gently sways down the track. They are so close, it seems you can touch the flowers if you extend your hand out just a little. 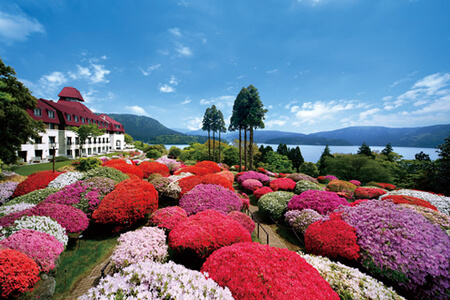 Welcome the season of azaleas in May at the Odakyu Hotel de Yama on the shores of Lake Ashi. Covering the hills of the vast park right on Lake Ashi and looking out to Mount Fuji are 3,000 azaleas of 30 different species. In the last part of the Showa period, likenesses of the Seven Gods of Fortune of Hakone were created from wood as the objects of worship throughout the area, so as to bring good fortune to those visiting the tourism areas around Hakone. 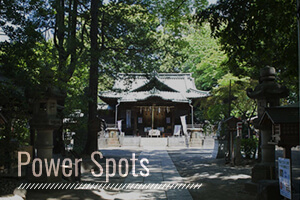 You are invited to seek good fortune by visiting these Seven Gods of Fortune, who have been worshipped with great devotion since ancient times! 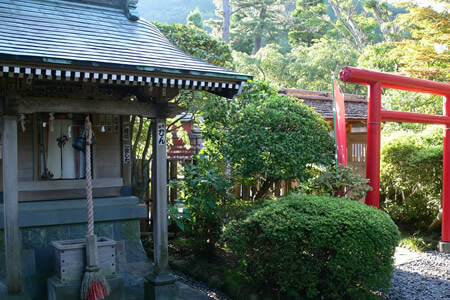 Experience the expulsion of evil at Hakone-jinja shrine. In Japan, it is believed that malevolent spirits come out when the seasons change. A ritual is performed to drive them away. 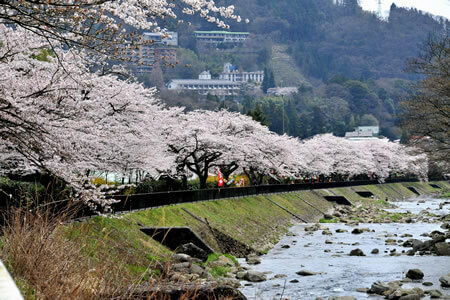 For some 450 meters, Yoshino cherry blossom trees line the Hayakawa River. Take a walk beneath the trees in full blossom while listening to the murmuring of the river. 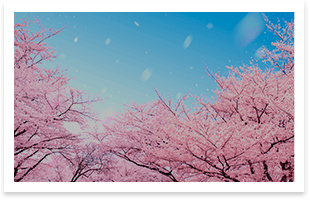 The trees are illuminated at night during the cherry blossom festival at the start of April, giving a illusory quality to the cherry blossoms completely different from the daytime. 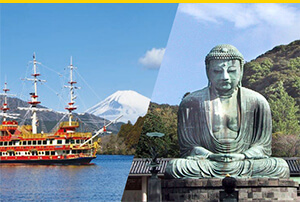 A discount tourist ticket that lets you travel throughout the popular Fuji-Hakone area.